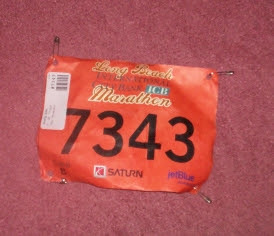 - It was my longest race since the marathon. - It was the first race I've repeated so far. - It was the first time I ran a race with people besides my sisters. I was trying to PR in this half-marathon, though my secret goal was to hit 2:00. It might have been able to happen had the weather not been so hot (it was low/mid 70's pretty mu ch in the beginning, which was a huge contrast to last year), my stomach didn't hurt, a chest muscle didn't cramp, and my hip didn't suddenly give up in the tenth mile. I had other forces working against me that morning, but I probably shouldn't elaborate. Anyway, the first few miles went smoothly. I was forcing myself to slow down because I knew I would lose it if I didn't. I hit the 10k point pretty quickly (for me, at least). I think anything over that mileage is no-man's land for me. I dramatically slowed down after the 10k point because everything started to fall apart. I already knew I wasn't going to make my goal at the 10k point, so I just accepted it and was now just aiming to PR. I didn't miss the GU station at mile 10 like I did last year, but after a small mouthful of chocolate gel, I gave up and drank water and Powerade. The last miles were brutal. I actually had to stop and walk a few times because of some of the things I listed above. Upon crossing the finish line, I took a finishing picture and proceeded to the food/fluid area, where I didn't get to "crust" any bagels because they were the onion kind (yuck). Luckily, I PR-ed, though not by as much as I had wanted. I know I was capable of doing better (based on training and the last race I ran), but with races, you never know what can happen. You just have to enjoy the experience for what it is. And I, of course, definitely enjoyed it. October is here and that means that the weather will be getting colder and perhaps wetter. It is also that time of year to get your flu shots. I just started to get them last year because I was afraid the flu would hit me hard and take me down and out of training. Some people say that getting the flu shot causes you to have the flu which in my experience is not true. I felt perfectly fine after I got the shot so this year I will be getting it again, that is unless they have a shortage again, in which case I will not get it so that those who need it more can. I personally think it is a good idea since to get sick right before the big race is just unfortunate. Also, as the weather gets colder I start to be more mindful of germs and getting sick which is why Vitamin C and Airborne are my friends during this time. I take Airborne in the tablet form. I just drop a tablet into a bottle of water and shake it up and drink it. I can't say that it is delicious because it isn't. It isn't bad just not great. Kind of taste like mediciny lemon-lime soda. Yes, it has somewhat of a fizz to it. I can say that it is better than Thera-Flu tea. I cannot say enough about prevention during cold and flu season. If you go to a public gym often then you will know that lots of other people also use those machine and sometimes even when they are sick. Go figure! So never rub your eyes or put your hands in your mouth after you have touch anything at the gym. I've gotten sick lots of time from using the gym. If you run outside, you lessen the chance of contact with as much germs but keep warm if it is cold out there. Germs are also on door handles and high contact areas so please wash your hands after contact and use antibacterial hand gels. 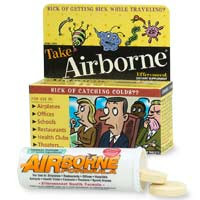 I normally have fears of germs but during cold season I am extra careful. Although if you have a very strong immune system then none of this matters. I have a friend who I will call Pigpen who tells me that he never gets sick even though he touches lots of yucky places and rarely washes his hands and then eats. If you are not like that than it is better to be safe than sorry. Finally, if you are planning to run the LA Marathon in '08 or any race in the spring, then this is the month to start training for it. I say this only because this is the month I will start logging lots of miles again. Good luck to everyone to get those runs in, it is especially tough for me with the upcoming holidays and such but the So. Cal weather is great for running during the Autumn/Winter season. So go out there and run! 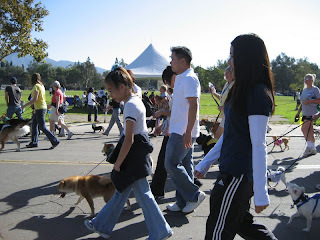 On Sunday, September 30, the Pasadena Humane Society hosted a 1 mi/3 mi walk called the Wiggle Waggle Walk for Animals at the Rose Bowl. I think I saw hundreds of dogs there with their loving owners who wanted to help raise money for less fortunate dogs with no homes. Two of my favorite pups, Bear the Shiba Inu and Teddy the Yorkshire Terrier, walked 3 miles in the hot morning sun. They had several water stations for the dogs, as well as one or two for the humans. The reason I mentioned this is because when I got to the mile 2 marker, I really thought we had walked more. It was really some of the longest 3 miles of my life because I was not really allowed to run. I guess running and walking are two very different animals (pun intended). I am back once again and this time to review the Ipod shuffle that I won as a door prize a few weeks ago. I am so lucky! I had the original shuffle and loved that it was so light and portable for those long runs but when I got this baby, wow, it is even better. 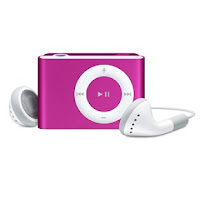 Aside from the fact that it smaller and has a built in clip, it can hold up to 240 songs (1 GB). I love the clip part because I use to have to wear my old shuffle around my neck or hold it in my hand since I was too cheap to buy an arm band. I also really love all the colors it comes in. Mine is pink. I saw it in purple yesterday and am only slightly jealous. I really like mine. Great improvement over the old design. ~ You'd rather run a marathon than go on a "real" holiday. ~ You spend too much time on the Internet reading about other peoples' workouts. ~ You get up earlier on weekends than you do during the work week. ~ You shower about 12 times a week. ~ When you go away for a weekend (or week) your most consuming thoughts are how you are going to get your runs in. ~ You wear more electronics on a run than are in the dash of your car. ~ A 5k is considered speedwork. ~ You daydream about Sunday morning's LR all week. 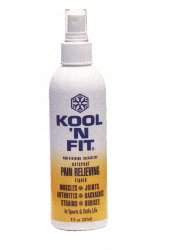 ~ Missing a day of running depresses the &*#@ out of you, even if you're sick or injured. ~ You understand what is meant by BQ,CIM,MCM, etc. ~ You can drink from a cup while running and don't mind that half goes on your chest. ~ Complete strangers come up to you and say "I saw you running the other day..."
~ The phrase "you're crazy" or "how can you possibly run that far" doesn't even warrant a response any more. ~ You've run more miles than you've driven so far this year. ~ You think ultra runners are only slightly crazy. ~ Your friends realize they can't threaten you with "I'll kick you out of the car right here" because they know you can make it home, and you might actually enjoy the challenge. ~ It's okay to have a mistake and run an extra mile, but if you realize you shorted yourself .2 miles on any run, you freak out. ~ You know who Pheidippides is. 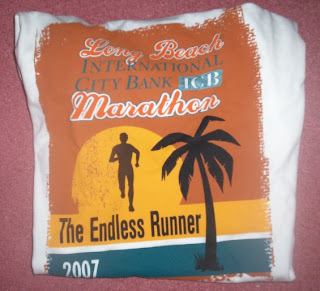 ~ You know the story of why the marathon is precisely 26 miles 385 yards (42,195 metres). 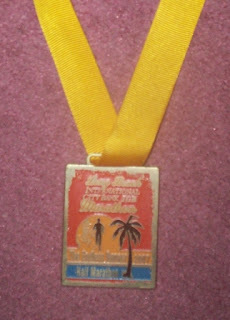 ~ You feel a little insulted when you tell someone you've just run a marathon and they ask, "Did you finish?"